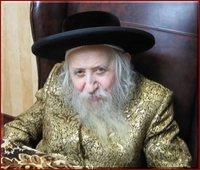 Also Known As: "R' Meshilum Feish Lowy", "Tosher Rebbe"
Meshulim Feish (Ferencz) Lowy, was born in Hungary in 1921, the son of a rabbi in the Hungarian town of Demetch who was known as the Demetcher rov (rabbi). His grandfather, Elimelech, served as a rabbi near the Czech border, in the town of Nirtash, from which the sect derives its name. Tosh (also Tash; Hebrew/Yiddish: טאהש) is a Hasidic dynasty originating in Nyirtass, Hungary. Today it is based in Kiryas Tosh, Quebec, Canada, outside of Boisbriand, a suburb of Montreal. In the United States, Tosher Hasidim have synagogues in Boro Park, Williamsburg, Brooklyn, Kiryas Joel, and Monsey, as well as in Montreal, Canada, and London England. Tosh is one of the large Chassidic groups in the world. Grand Rabbi Meshulam Feish Segal-Loewy, the Tosher Rebbe remarried after being widowed for many years. Many of the Tosher Rebbe's talks have been written down in a series of five books entitled "Avodas Avodah." Two of them are Hebrew language books that explain the weekly Torah portions, and Jewish holidays with practical insights into divine service which are subtitled: Dibros Kodesh. Two of them are Yiddish language books that explain the weekly Torah portions, and the Jewish holidays with practical insights into divine service which are entitled: Imros Kodesh. Another is mostly in Hebrew, but has Yiddish segments. It is a compilation of addresses that the Tosher Rebbe has made regarding the Yahrzeit (day of passing) of a large number of Jewish holy men, arranged according to the Jewish calendar. It is subtitled Sichos Kodesh. The first Tosher Rebbe was Grand Rabbi Meshulam Feish Segal-Loewy, a disciple of Rabbi Yitschok Ayzik of Komarno, author of Heichal HaBrocho. Rabbi Yitschok Ayzik was a disciple of Rabbi Tzvi Hirsh of Zidichov, a disciple of the Chozeh of Lublin. The Chozeh was a disciple of Rebbe Elimelech Lipman of Lizhensk, author of Noam Elimelech. The Rebbe Elimelech was a disciple of the Rebbe Dovber, the Maggid (Preacher) of Mezeritch, the primary disciple of the Baal Shem Tov, the founder of Hasidism. Grand Rabbi Meshulam Feish Segal-Loewy of Tosh - disciple of the Heichal HaBrocho. o Grand Rabbi Elimelech Segal-Loewy of Tosh - son of Rebbe Meshulam Feish. + Grand Rabbi Mordechai Segal-Loewy of Demecser - son of Rebbe Elimelech of Tosh. # Grand Rabbi Meshulam Feish Segal-Loewy (Lowy) of Tosh - present Grand Rebbe of Tosh - son of Rebbe Mordechai of Demetsche. Kiryas Tosh Hasidic community - Broisbrank, Quebec.